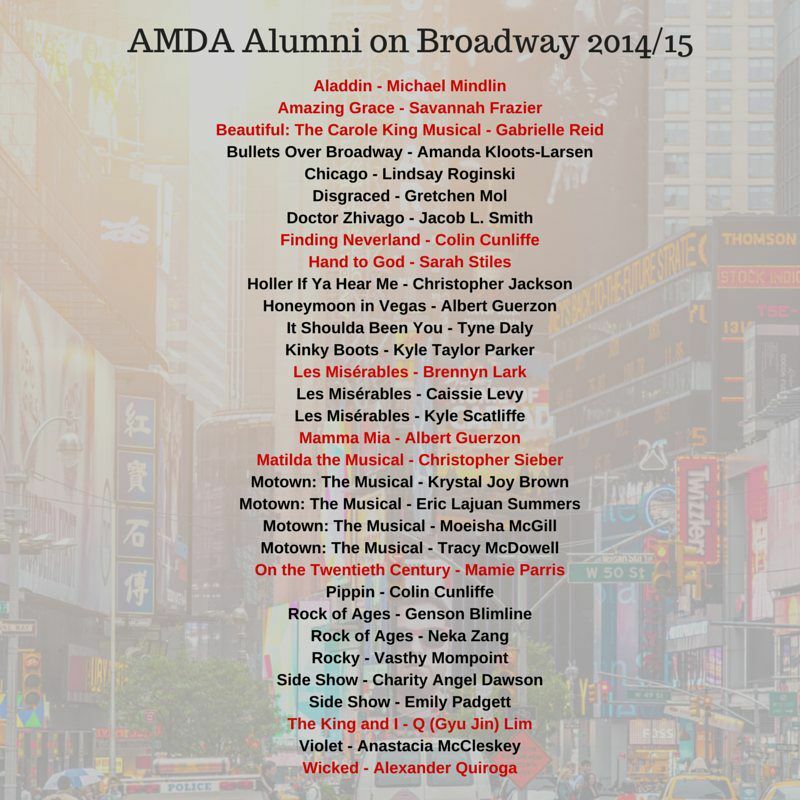 AMDA | AMDA News - What do these 30 AMDA alumni have in common? As summer is about to officially kick off, let’s take a moment to look back at the extraordinary work AMDA alumni have done on Broadway during the past year. From long-running, blockbuster musicals (Wicked) to side-splitting comedies with puppetry (Hand to God), 30 AMDA graduates delivered bold, captivating performances in 25 different Broadway productions. Four of the 2014/15 Broadway productions had more than one AMDA alumni in the cast. Leading the way was Motown: The Musical, with four AMDA graduates. And the riveting revival of Les Misérables had two AMDA graduates in starring roles—Caissie Levy as Fantine and Kyle Scatliffe as Enjolras. A number of alumni also received award nominations for their performances, including Sarah Stiles (Hand to God, Tony Award nomination for Best Performance by an Actress in a Featured Role in a Play); Tyne Daly (It Shoulda Been You, Drama League Award nomination for a Distinguished Performance Award); and Emily Padgett (Side Show, Fred and Adele Astaire Award for Best Female Dancer). Eleven Broadway productions currently have AMDA alumni performing in them. So if you’re heading to the Great White Way this summer, look out for the productions and names highlighted in red below.